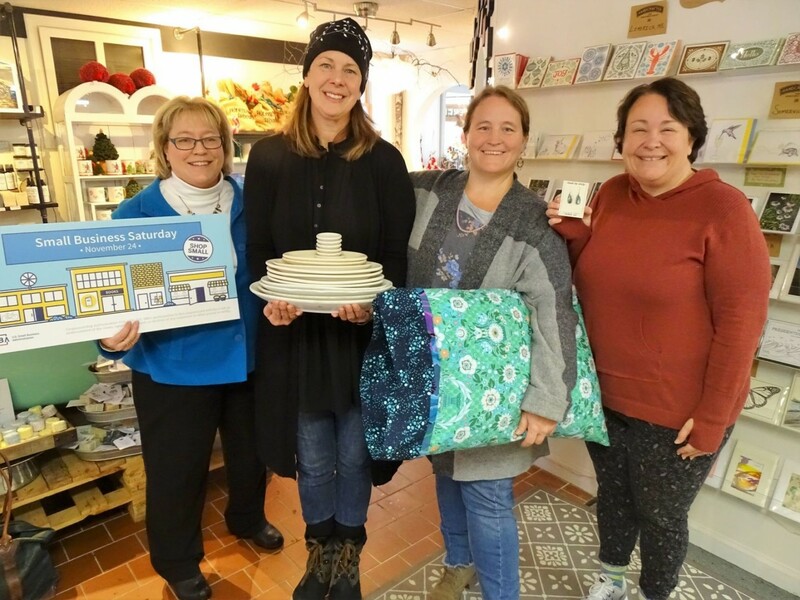 DOVER — Businesses on the Seacoast are inviting people to come and spend the weekend shopping while supporting local retailers. Close to 50 businesses in Dover have signed up to participate in Plaid Friday and Small Business Saturday, offering deals to shoppers on both days. Reid Weston, economic development assistant for the city of Dover, said this weekend will be hopping with holiday shopping and the annual parade happening Sunday. “There’s enough to fill a whole weekend here,” Weston said Tuesday afternoon. Weston is challenging everyone in New Hampshire to support small businesses this season by buying at least one gift downtown, eating at a restaurant owned by a small business owner, seeing a show with performers from the area, buying a piece of artwork and pampering themselves in a local salon. Danielle Festa has been updating the website, www.dovermainstreet.org, with all of the different specials available in the historic Garrison City. Dover Main Street is a nonprofit downtown revitalization organization that operates under the auspices of the National Main Street Center. Festa said that, when she moved to Dover a few years ago, she was impressed by how much is done to support small businesses during the holiday season. She said the city is the perfect spot to enjoy a traditional New England storybook experience. In neighboring Durham and Rochester, retailers are trying to capture that same magic for the holiday season. On Tuesday morning, Greta Johansson with the Small Business Administration visited Durham to learn more about their efforts to attract shoppers for Small Business Saturday. At Durham Main Street Makery, owner Sarah Grandy said she works with 50 artists — many who live within walking distance of the shop — to provide unique items for customers. Jeweler Emily Slama, of Durham, crafts earrings, necklaces and bracelets from sterling silver and 14-karat gold. Unlike chain stores, the gemstones she uses are natural. On display is a pair of earrings made from Ethiopian opals and tanzanites for less than $50. “I feel very supported as a local jeweler to have my jewelry here in Durham. It’s so satisfying to see people wearing it,” Slama said. Next door at The Candy Bar, owner Chris Guerrette talked about the chocolates he imports from overseas specially for the holiday season. “What I like to do is work with some vendors who buy everything from Europe and bring things over from Germany, France, Spain, Italy, et cetera. And the reason I like to do that is because it’s a very high quality chocolate. It’s a very unique product that you can’t find necessarily in other locations, and it gives us a big, big selection,” Guerrette said. Guerrette also has a 5,000-square-foot store in Dover named Lickee’s and Chewy’s Candies and Creamery, where he has four staff members making chocolates for both locations. Guerrette was in the Air Force for almost 25 years and said he has always wanted to own a candy shop because of all the traveling he did in the service. “I’ve loved candy my whole life. My wife says I have candy radar,” Guerrette said. Johansson also traveled to Rochester on Tuesday afternoon, where U.S. Sen. Jeanne Shaheen joined the tour of downtown businesses, including the Rochester Opera House, Sweet Peach’s Candy and Confections as well as The Artisans’ Gallery. In a statement, Shaheen said New Hampshire’s small businesses are the backbone of the regional economy. “I was glad to stop by some of our shops in downtown Rochester today with Mayor McCarley and Greta Johansson from New Hampshire’s Small Business Administration to talk about the importance of shopping local this holiday season and supporting our great businesses right down the street,” Shaheen said. In downtown Portsmouth on Tuesday evening, the owner of Hazel Boutique was decorating her store windows for the season. She is running specials on both Plaid Friday and Small Business Saturday, which includes a Saturday raffle where people who spend $150 are entered to win a Rewind Candle, Matt & Nat bag or a piano wire necklace. Kerry LaJoie said it’s a wonderful time of year to be in Portsmouth because of the people and unique items found in all of the local shops. Valerie Rochon, president of The Chamber Collaborative of Greater Portsmouth, said economic impact studies estimate that the multiplier effect of shopping with local, independently owned and operated retailers recirculates 48 percent of each purchase back into the local economy. That’s almost 30 percent more than purchases from other retail operations, Rochon said.